Fulham midfielder Tom Cairney says "it's a given" Scott Parker will get the manager's job permanently after securing his first win in caretaker charge against Everton. Cairney and Ryan Babel were on target for the relegated Cottagers, ending a run of nine successive defeats with their first Premier League win since January. Five of those defeats have come under Parker, who succeeded Claudio Ranieri at the start of last month. "Ever since Scott Parker was put in charge it has been a step in the right direction. It has been hard to get a win. But the performance has improved," said Cairney. "You can see the way the players play for him, the way they respond. If there has been that improvement in four or five weeks it's a given [he will get the job]." 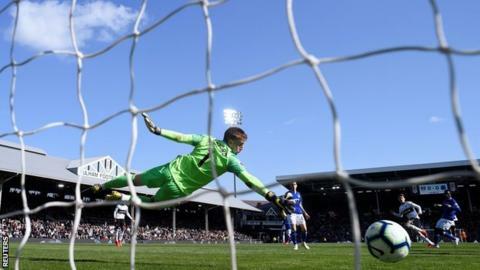 Fulham opened the scoring 30 seconds into the second half at Craven Cottage when Cairney stroked home Babel's pass from just inside the area for his first goal of the season. Babel then ran on to Aleksandar Mitrovic's pass to double Fulham's lead. Dominic Calvert-Lewin had Everton's best chance but his clipped effort hit the outside of the post, as the Toffees' three-game winning run came to an end. It was a deserved victory for Fulham, who kept just their third clean sheet of the season and first since December. Mitrovic was a constant threat and had the best chance of a quiet first half, but his shot from inside the area hit the top of the bar. Everton offered little in reply, with Bernard's tame first-half effort their only shot on target. The defeat means Marco Silva's side stay ninth and miss the chance to move above Watford and Wolves into seventh. Fulham caretaker boss Parker said before the game that he was planning for the future with the Cottagers' relegation already confirmed, even with his own position uncertain. The former England midfielder must have been hugely encouraged by a dominant performance from his side. Fulham have the worst defensive record in the division but comfortably held Everton at bay to keep a rare clean sheet, while they threatened in attack throughout the game. Their display was perhaps summed up by an all-action performance from Mitrovic, who gave Everton defenders Phil Jagielka and Kurt Zouma a torrid afternoon. The Serbian had seven efforts on goal in the first half alone, drawing a smart stop from Jordan Pickford before smacking the bar with a shot just inside the area shortly before the break. Cairney, one of Fulham's best players when they were promoted from the Championship last season, also stood out and was perfectly placed to meet Babel's pass to score the opener. Mitrovic then showed great awareness to clip a pass through to former Liverpool forward Babel, who raced away from Seamus Coleman before calmly lofting the ball over Pickford. The question for Parker is whether Fulham can keep the likes of Mitrovic, Cairney and Babel when in the Championship next season. If a number of senior players are sold then opportunities may open up for the likes of Harvey Elliott. The midfielder was named on the bench at just 16 years and nine days old and may get a run in the next few weeks as Parker looks towards next season. Everton went into this game on the back of three successive wins without conceding a goal to reignite hopes of qualifying for Europe. But the Merseysiders saw that momentum brought to a shuddering halt with a timid display, with boss Silva left to rue his side's inconsistency. The Toffees rarely threatened during the first half, with their best chance coming from a Seamus Coleman cross that just evaded the diving Calvert-Lewin. Whatever Silva said at half-time was then rendered redundant within 30 seconds of the restart, with the Toffees never really threatening a comeback. Calvert-Lewin came closest to an equaliser when he ran on to Gylfi Sigurdsson's neat reverse pass, but his flicked finish could only hit the outside of post with Rico beaten. Despite the defeat Everton remain in the hunt for seventh place, which could yet yield a Europa League spot if Manchester City beat Watford to win the FA Cup. Silva may now be wondering which Everton side will turn up when Manchester United arrive at Goodison Park next weekend. Fulham caretaker manager Scott Parker to BBC Sport: "We were fantastic from start to finish. We showed a real quality in the way we played and showed grit, That was something I drummed on about, our naivety. We have worked hard over the last 10 days. To a man we were fantastic. "We have let in a number of goals, which has let us down. A clean sheet was pleasing but most important thing was way we played with the ball. As a team we produced some good stuff. "Ryan Babel is a player that can get you off your seat, he has done that today at times. He showed composure and skill to produce another wonderful finish. Tom Cairney was the catalyst to what we did. "Relegation brings uncertainty and doubt. The mainstay are the fans. We have a duty to them and ourselves to put in a performance today and exemplify how good this squad can be. With four games left this has to be the standard." Everton boss Marco Silva told BBC Sport: "It was a disappointing result, we did not perform in the way we want. You have to do more and better because we have the quality to do that. "The first half we did not play really fast and create problems. It was not a good first half. Then we start the second half and they score. We were not aggressive enough. Fulham recorded their first Premier League win in 10 games, having lost the previous nine fixtures. Everton have won just one of their past 12 Premier League away games in London (D3 L8). Fulham's Tom Cairney scored his first Premier League goal since netting versus Everton in March 2010 for Hull - 3,324 days ago. Since his debut in January, Ryan Babel has been involved in more Premier League goals than any other Fulham player (four goals, three assists). In his 103rd appearance in the competition, Babel both scored and assisted in a Premier League match for the first time. Fulham travel to the south coast to take on Bournemouth on Saturday, 20 April (15:00 BST). Everton host Manchester United at Goodison Park the following day (13:30 BST).